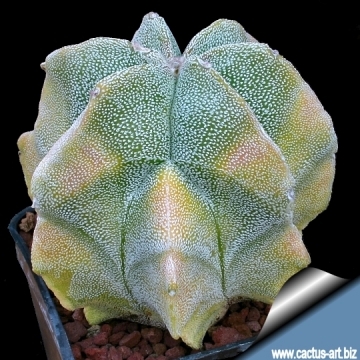 Description: The classical Astrophytum myriostigma is a spineless succulent plant, with a many dotted, usually solitary, stem. A transverse section of the stem reveal a perfect star shaped form (like the common star-fish) giving the plant the appearance of a bishop's mitre (hence the common name Bishop's cap). 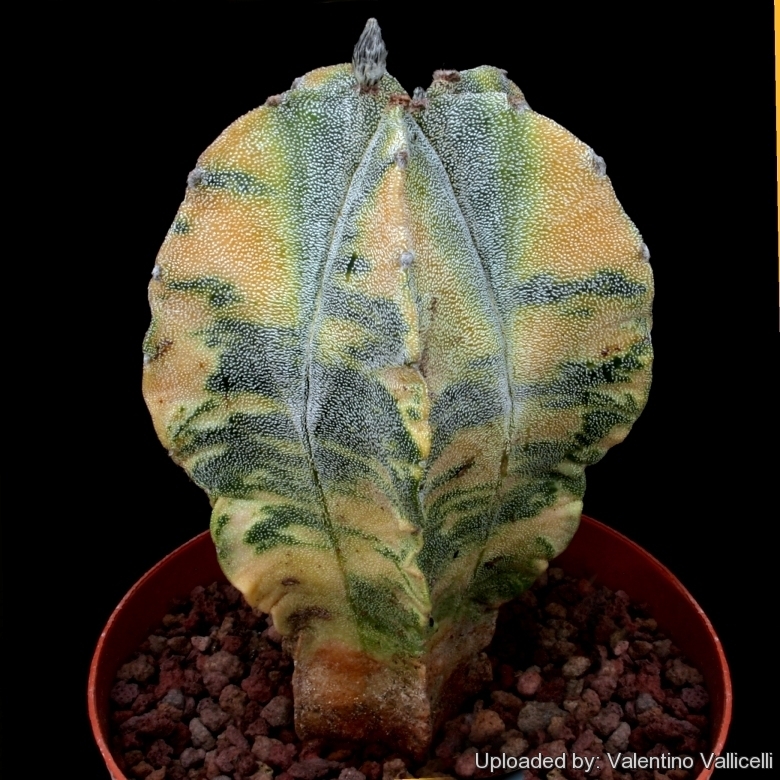 The variegated form Astrophytum myriostigma f. variegata has sectors, patches or stripes with distinct shades of yellow or orange. 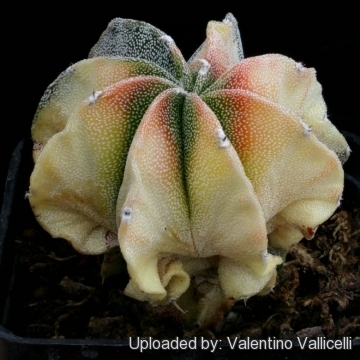 All variegates are mutants. Something has gone wrong with the cellular structure of the growth tip (apical meristem) of the plant. As a result of this mutation, chlorophyll is missing from some or all layers of the plant epidermis. The odd variegate appears in many seedling batches in a small percentage (especially among hybrid seeds) and are generally separated from normal plants. Variegated plants grow slower and are generally smaller than non-variegates of the same species. Coloured areas are also generally weaker, and more susceptible to fungus, sunburn and other defects. A large well grown variegate Astrophytum is truly an achievement. These are harder to grow well than they appear. Plants with variegated stems are often attractive and highly prized. Stem: Bright green, yellow and orange, covered with many minute white hairy scales that give it a characteristic chalk-white or silvery-grey appearance, globular to cylindric up to 60 cm tall and 10-20 cm in diameter. The scales are composed of very fine interwoven hairs, which, under a microscope, are very pretty object. Notes: Variegation, albinism & schizochromism. 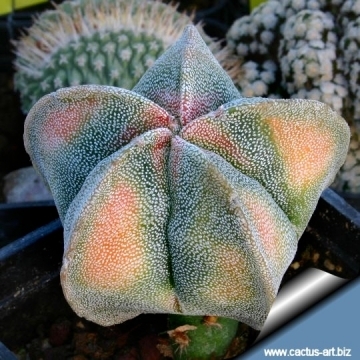 Cultivation and Propagation: Variegated cacti are regarded as choice and difficult in cultivation, but despite that many of them are relatively easy to grow. But be aware that they cannot tolerate prolonged exposure to direct sun light (especially during the hottest summer days), so grow them in half-shade or under filtered sun. They are sometime seen as grafted plants, but many grow well on their own roots, too.